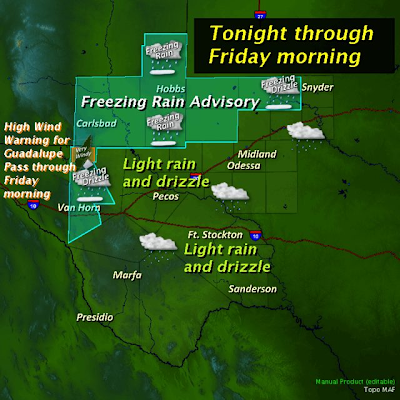 Freezing Rain Advisory For SE New Mexico! Blog updated at 6:35 PM MST. 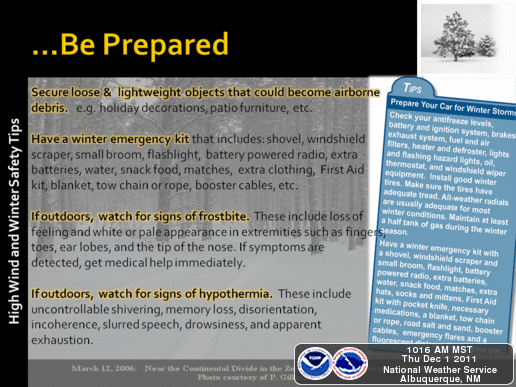 Special Web Briefing From NWS Midland. Special Web Briefing From MWS El Paso. Special Web Briefing From NWS Lubbock. Here is a good indicator of just how dynamic and strong the upper-level to our west is. Overnight, a wind gust to 167 mph was reported at Henninger Flats, California, at an elevation of only 2,800'. Mammoth Mountain at 11,000' took a gust to 150 mph. A Winter Storm Warning has been issued by the Albuquerque National Weather Service Office for Chaves and Lincoln Counties. This warning will be valid from 6 PM MST Friday through 5 PM MST Saturday. 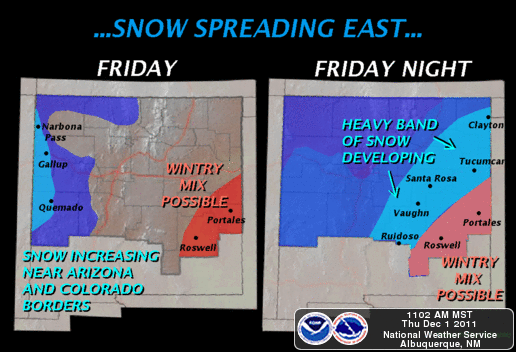 Heavy snow accumulations are now forecast for Friday night into late Saturday afternoon across parts of south central, southeastern, and eastern New Mexico. 4" - 8" are forecast to fall across the eastern plains. Lesser accumulations will fall across Chaves and Roosevelt Counties where a mix of snow and sleet is forecast. 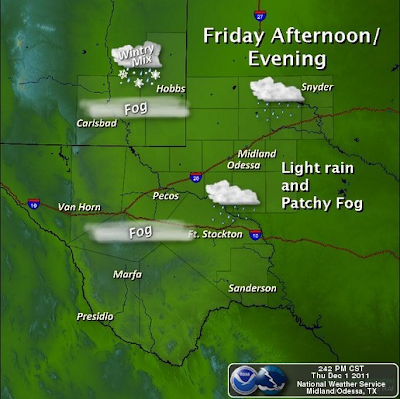 A band of heavier snow will fall roughly over an area stretching from the Sacramento Mountains northeastward towards Santa Rosa, Tucumcari, and southern Union County. 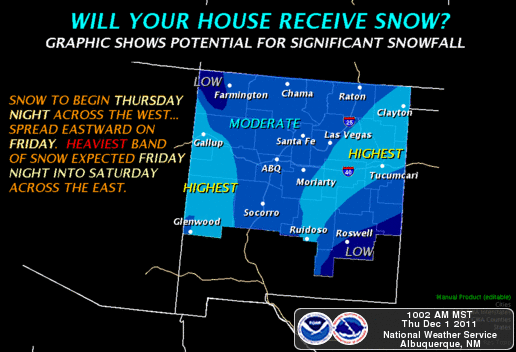 Snowfall totals of 8" - 12" are now forecast to occur in these areas. 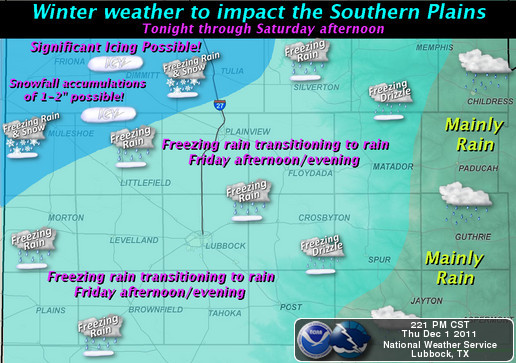 A Freezing Rain Advisory has been issued by the Midland NWS Office for Eddy, Lea, and Culberson Counties. 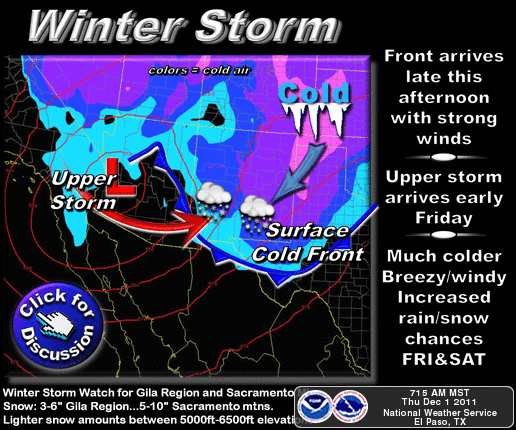 This warning is valid from 8 PM MST tonight through 8 AM MST Friday morning. Light freezing drizzle, light freezing rain along with areas of freezing fog will drop the visibilities down to less than one mile across these areas at times. Area roadways may become slick and hazardous, if not downright dangerous to travel on especially over the bridges and overpasses. Black ice may form on our roadways, and could be difficult to see or detect until your vehicle goes into a skid on the roadways. Please drive defensively. Arctic air is surging south through the area now. 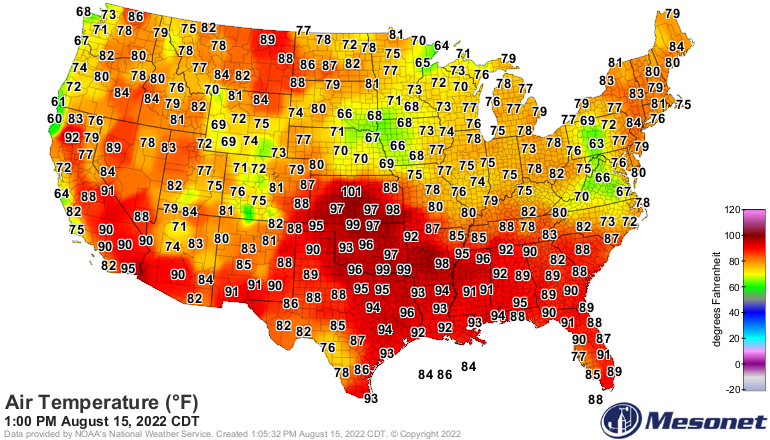 Temperatures will continue to fall throughout the night. 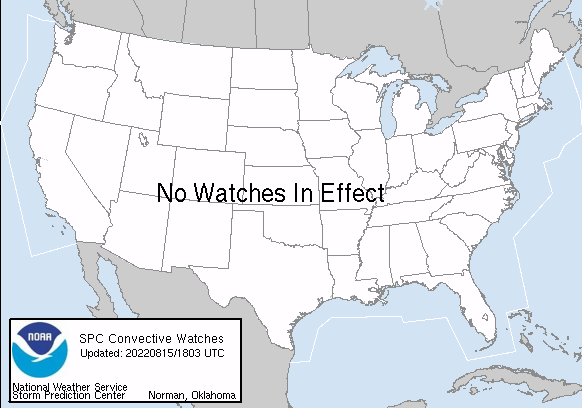 Our highs are forecast to only be in the 30's tomorrow. Wind chill values will drop down into the single digits and teens across the area tonight into tomorrow morning. 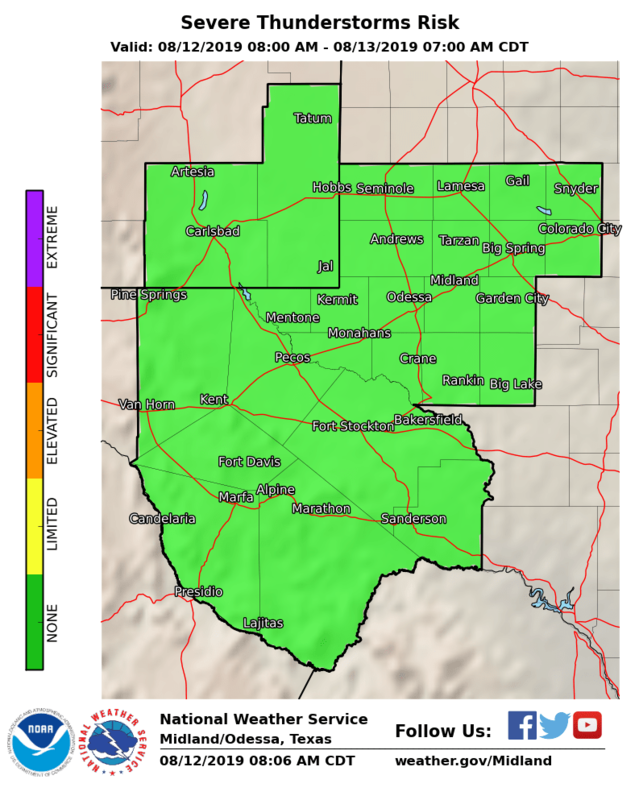 A wintry mix of light freezing drizzle, light freezing rain, sleet and snow will occur across Eddy, Lea, and parts of Culberson Counties (Guadalupe Mtn's) late tonight into Saturday. Total snowfall accumulations are now forecast to be 2" or less for Artesia-Carlsbad-Hobbs. Snow, heavy at times, combined with blowing and drifting snow will make travel across many areas of the state downright dangerous, if not impossible in some locations tonight into the weekend. Freezing drizzle, freezing rain, and freezing fog will also complicate driving conditions across SE NM. 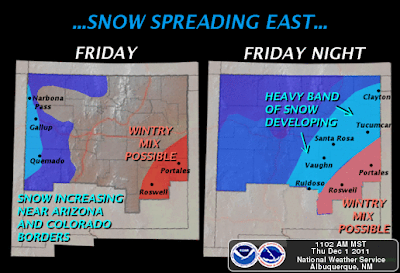 Road closures are anticipated across parts of the state, possibly including parts of I-25 and I-40. For the latest road conditions pleas visit this link. 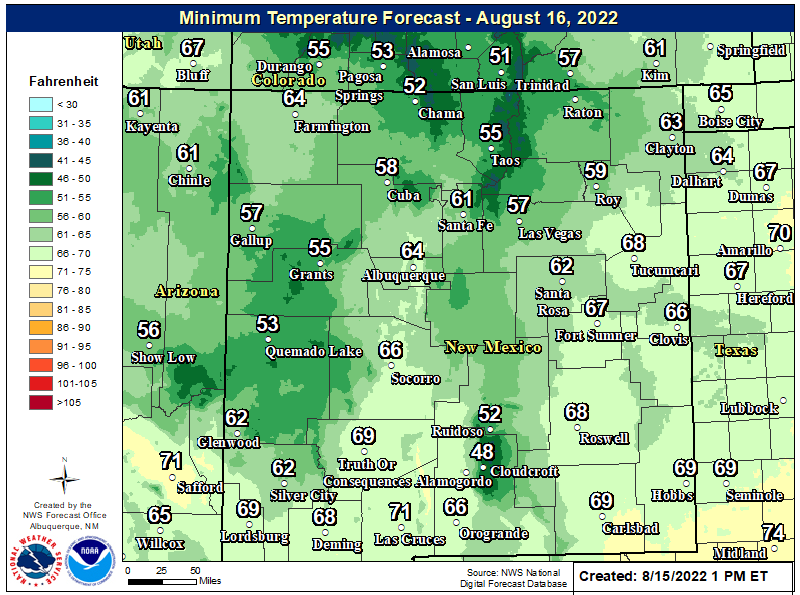 A High Wind Warning is now in effect for the Guadalupe Pass area from 5 PM MST this afternoon through 8 AM MST Friday morning. Northeasterly winds sustained at around 40-50 mph will gust up to near 60 mph. Guadalupe Pass is also under the Freezing Rain Advisory, so travel through the pass could become extremely dangerous in the icing conditions, high winds, and low visibilities. 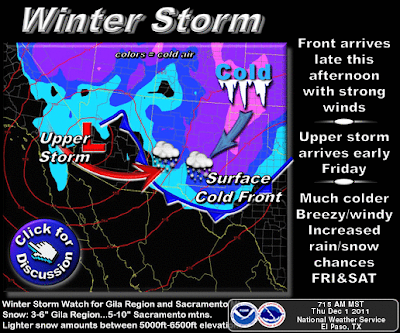 A Winter Storm Warning is now in effect for the southern Sacramento Mountains. 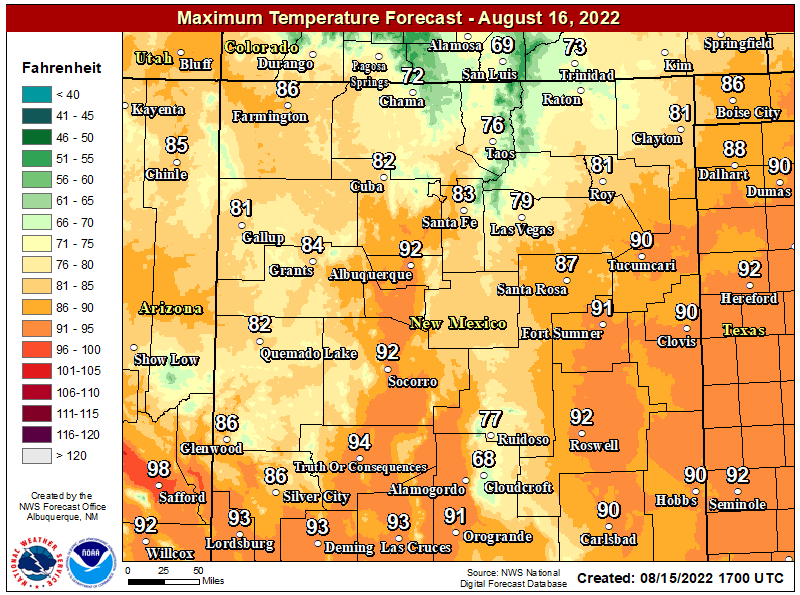 This includes the Cloudcroft, Mayhill, Weed/Sacramento, Timberon, High Rolls/Mountain Park areas. 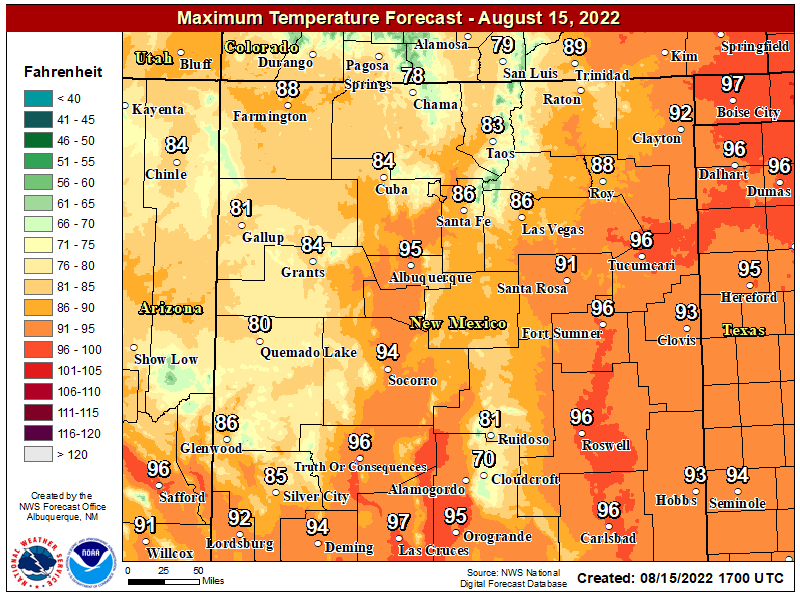 The warning is valid from noon on Friday through 6 PM MST Saturday evening. Locals above 7,000' are forecast to receive 6" - 12" of new snow, 3" - 5" is forecast to fall below 7,000' down to about 5,000'. 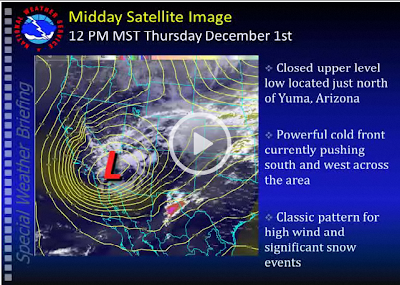 The Desert lowlands could see a couple of inches of snow by Saturday afternoon. A measured wind gust to 88 mph was reported at the Sandia Peak Tramway base station today. 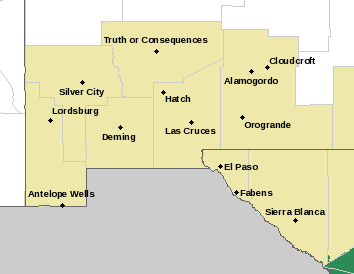 The strongest winds are forecast to occur across Albuquerque Metro Area, the Lower Rio Grande Valley, and the Central Mountain Chain from late this afternoon into tonight. 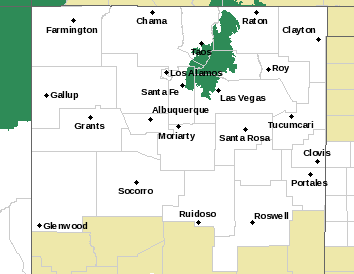 Power outages have been reported in Albuquerque along with some wind damages. 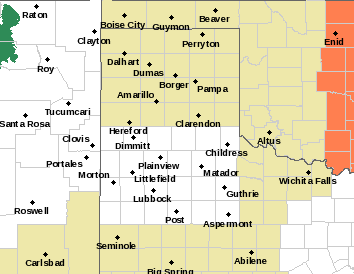 A High Wind Warning continues in effect for these areas into tomorrow morning. 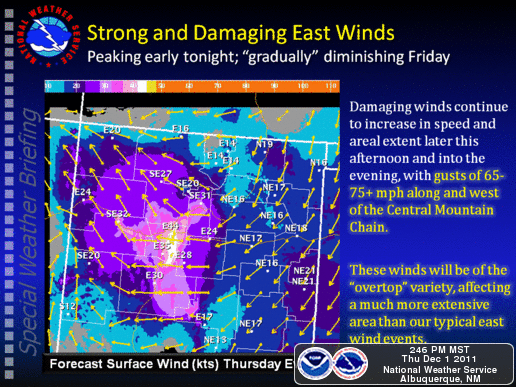 Wind gusts of 75 mph will be possible. Other peak wind gusts can seen by clicking on this link. 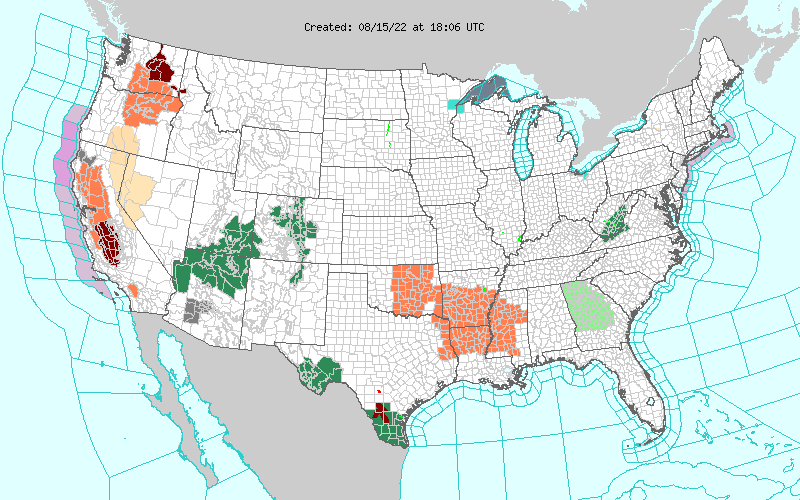 New data continues to stream in from our local National Weather Service Offices and the computer forecast models. I will keep this post updated throughout the afternoon into tonight as the new information and forecasts becomes available. Thanks again for stopping by.